I’ve noticed an increase in three lined potato beetle (Lema trileneata) numbers in my garden in recent years- due in part, I think, to the volunteer potato plants that sprout from tubers left in the soil. The adults overwinter and begin feeding in May on nightshade family members. They prefer tomatillo and potato. 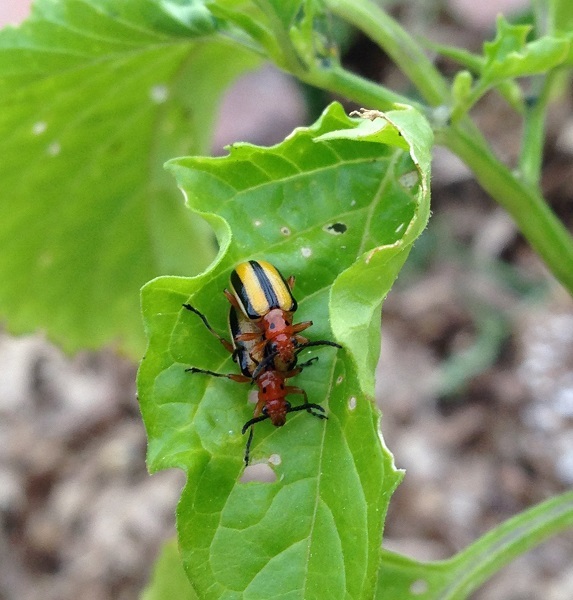 Adult three lined potato beetles mating on tomatillo leaves. The larvae are gray in color and pack their excrement on their backs for protection from predators. Adults, eggs, and larvae are all easy to handpick. Scout for and control this pest early in the season to prevent significant injury to seedlings and transplants. Floating row covers can also help prevent feeding. Check out this nice Bug of the Week entry on this insect (with a video clip) from Dr. Mike Raupp. That's what's been eating my tomato plants' leaves. Hungry little guys! I wonder if they've been flying under the radar- no pun intended.